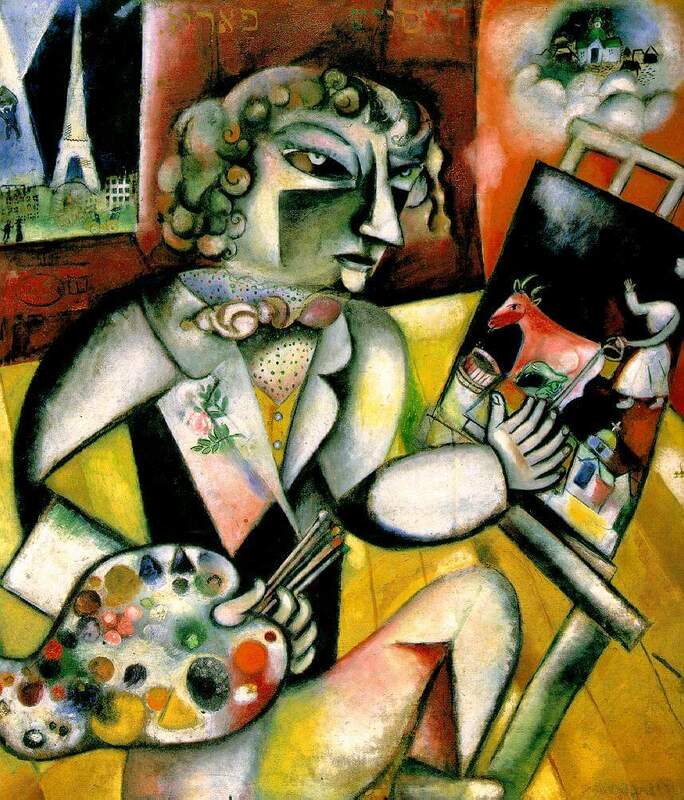 Self-Portrait with Seven Fingers was Marc Chagall's first self-portrait, painted in 1912-13. He was about 25 years old at the time. 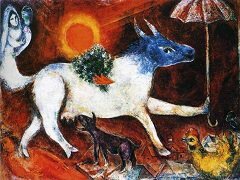 It was painted in his first Paris studio in Paris, where he and 200 fellow artists lived in very poor conditions, among them, there are Picasso, Joan Miro, Georges Braque, and Piet Mondrian. It's an example of how artists can include personal meaning and history in their self-portraits. 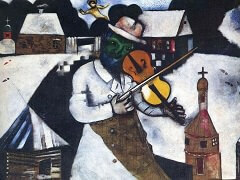 Chagall grew up in Belarus, now an independent country, but then part of the Russian empire. His father was a laborer (unskilled construction worker) who struggled to make enough money to support the family. 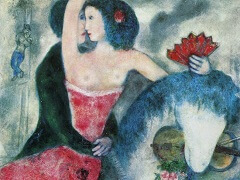 While Chagall spent most of his life in France, he never stopped returning to Belarus in his mind and in his art. In Self-Portrait with Seven Fingers, two landscapes hover above the painter: his new home of Paris and the memories of his childhood village in Belarus. 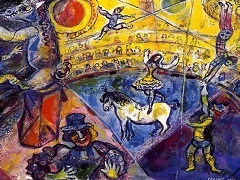 Chagall's Jewish heritage shows strongly in much of his work, with references to traditional folktales, fables, and beliefs. 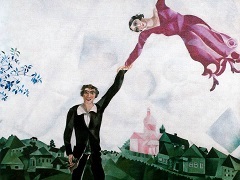 In Self Portrait with Seven Fingers, Chagall refers to the colorful Yiddish folk expression Mit alle zibn finger, (with all seven fingers,) meaning "working as fast and as hard as possible". That explains the extra fingers! The broken, puzzle-like appearance of the objects in the painting is an influence from Cubism, a popular style of painting at the time. 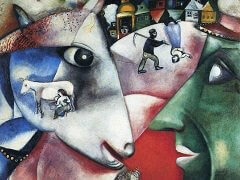 Chagall was experimenting with Cubist methods of breaking up reality and reassembling it in new ways.